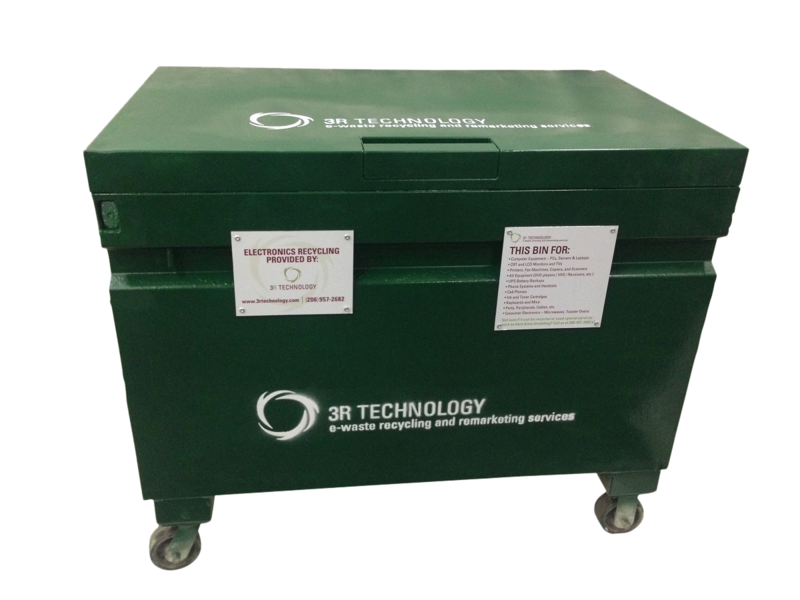 Our Secure e-Waste Collection Bin Service provides an easy to manage, low-cost solution for securely storing your data-containing media and proprietary materials prior to destruction and recycling. Our service eliminates concerns of hard drives, optical or magnetic backup media, prototypes or other sensitive items being stored in a manner that may make them susceptible to unauthorized access or theft. ✔ Easy – Simply call us, email us, or scan the QR code on the bin to schedule a pickup service. ✔ Convenient – Our secure bin can be stored in almost any area, and fits through any standard construction doorway. ✔ Tracked– A Certificate of Recycling & Destruction is provided for each pickup with the total weight of material collected. ✔ Certified– We are an R2:2013 and IS0 14001 certified recycler, providing you 3rd party assurance that our e-waste recycling process is conducted in the safest, most ethical, and ecologically sound manner. ✔ Secure – Solid steel construction throughout. Lock is recessed to prevent tampering. Only authorized staff may have key access. We can shred most hard drives and media onsite right where the secure e-waste collection bin is located. All we require for operating our mobile shredder is a standard 11 V 20-amp dedicated circuit. Witnessed or secure shredding at our facility is also offered, as well as secure destruction of proprietary materials. ✔ Low Cost – Our custom, secure bin is available for a low monthly fee, plus the cost of destroying or shredding your sensitive materials.